Gold futures were little changed Wednesday but up from their previous close at a more than 5.7-year low. Gold for December delivery added a dime to settle at $1,068.70 an ounce on the Comex division of the New York Mercantile Exchange. "Gold bulls have been disappointed there has not been more robust safe-haven demand following the major terror attacks in Paris," Jim Wyckoff, a senior analyst at Kitco Metals Inc., said in a report. "The modest safe-haven demand for gold that has been seen has been trumped by the rally in the U.S. dollar index, which has hit a seven-month high this week." Gold prices ranged from a low of $1,062 to a high of $1,074.60. They dropped 1.4% in the previous session to close at their lowest level since Feb. 8, 2010. Down for the twelfth time in thirteen sessions, silver for December delivery shed 9 cents, or 0.6%, to close at $14.08 an ounce. 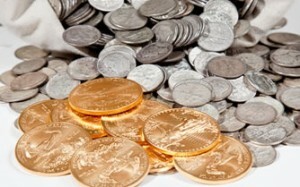 The settlement was the lowest since Aug. 26 when the white metal ended at $14.04 an ounce. Silver prices ranged from $13.99 to $14.21. For the week so far, they are 0.9% lower. January platinum declined $7, or 0.8%, to $848 an ounce, trading between $846.10 and $857.10. Palladium for December delivery fell $14.45, or 2.6%, to $532.05 an ounce, ranging from $527.50 to $551.35. Gold dropped $11.45, or 1.1%, to $1,067.75 an ounce. Silver lost 8 cents, or 0.6%, to $14.17 an ounce. While U.S. Mint sales of silver coins were muted Wednesday gold coins surged by 15,000 ounces, bringing their three-day total for the week to 42,500 ounces. That is the most during any week since the one ended Sept. 18 when gold sales jumped by 49,500 ounces. The Mint this week limited sales of American Silver Eagle to 900,000 coins. Of those, 49,000 are left. Sales at 42,880,500 for the year are on a record pace, up 5.4% from the same time in 2014. Last year when Silver Eagle sales ended at an annual record of just over 44 million, the bullion coins by Nov. 18, 2014 had posted sales of 40,691,500.